Experiencing the Chukchis' traditional festival. It seems that even the sun knows what an important day it is in the Chukchi calendar, so it decided to make a rare appearance. The mood on board is joyful and celebratory - everyone is in anticipation of the annual Beringia Regatta and Festival. Barring reindeer and the tundra, I didn't know much else about Chukotka as a region before coming on this expedition; I was looking forward to being surprised by something absolutely unknown every day. But one thing I did know of before were the Beringia Arctic Games. Needless to say, I'm feeling quite excited! Because the opening of the games wasn't till 11 a.m., we could finally have a slow morning with a relatively late breakfast and some relaxed tea drinking. We arrived on the shores of Novo Chaplino around 10:30, which gave us time to have a look around the souvenir stalls where locals were selling all kinds of traditional things made of fur, ivory, bone and non-animal material. Even before the official start you could feel a spirit of celebration sweeping over the little settlement - after all, this is the most eventful weekend of the year for the entire region! 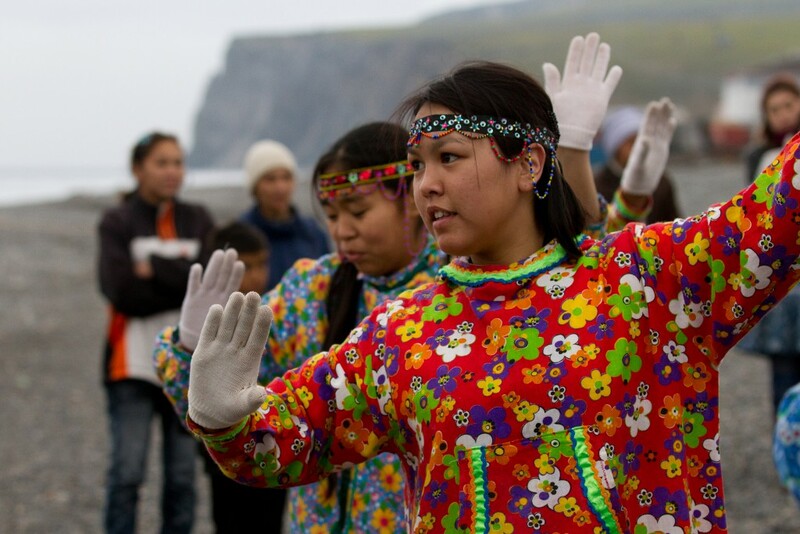 The program included baidara (traditional Chukchi walrus skin-covered boats) racing, sports competitions such as the triple jump and the "Eskimo" jump as well as a range of cultural performances. The timetable of these events wasn't immediately clear so we all just went with the flow. First, there was the usual introductory speech from the organizers and regional government officials. The governor of Chukotka was supposed to come but due to unsuitable flying conditions in Anadyr, he couldn't make it. After the Russian flag was raised to full mast and the national anthem was sounded, the 2016 Beringia Games had officially begun! While the men's baidara racing was getting under way by the shore, a traditional song and dance ensemble took to the stage to further raise everyone's spirits. The dancing happened to the incredible vocal range of the ensemble's main vocalist: she effortlessly went from howling like a seal to demonic guttural sounds to mighty battle cries to almost angelic singing. A group of "neighbors" from Alaska, who have managed to preserve the traditions of their common Bering cultures, also made a surprise appearance that included singing and dancing. Eventually the sun decided to grace us once again with its presence, even if just for a little while. There was no timewasting, and as soon as the first rays shone through the clouds, the juniors were in their baidaras ready to race and the stage was alive with local folklore ensembles. The spirit of fun and celebration was back in Novo Chaplino. It was literally all fun and games, but towards the late afternoon, we needed to make our way back to the Spirit of Enderby. All in all, it definitely was an honor to be able to share this experience with the Chukchi and I feel like today we really got to the heart, soul and history of this indigenous group. I feel like they, too, really enjoyed showing us their rich heritage in all its glory. Tomorrow's a fun one from a geographic point of view: Cape Dezhnev - the north-eastern most point of the Eurasian continent.